Sept. 16, 2014—Zora and Wilma, American bison from the American Prairie Reserve in northeastern Montana, arrived at Smithsonian's National Zoo recently. 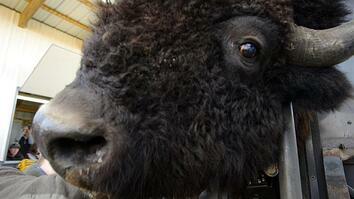 Bison started the zoo's living collection in 1889 and helped spark the conservation movement. To name Zora and Wilma, the zoo collaborated with two local schools—Howard University and Gallaudet University—whose mascot is the bison. 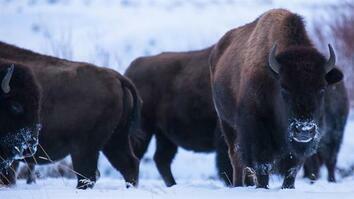 So today we’re here to introduce our two new bison to our community and around the world. The bison were actually the first animal that was brought to the zoo and helped start National Zoo. They are a species that was estimated to be a population of about 30 million, and down to about 360 by the mid-1800’s. The National Zoo, as well as other zoos, we are involved in saving species. Here she comes (indistinct chatter). These two bison came from the American Prairie Reserve. 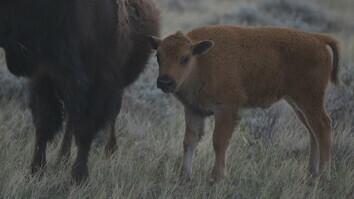 Right now we have about 350 bison, and that's not including approximately 90 calves that are going to be born this year. They can actually handle many, many different temperatures and climates. They can handle drought, rain, floods. A wide variety of heat and cold. Fire, humidity, just about anything you can throw at them. They should have no problem just fitting into the DC area. Right now our two females weigh in the 500 pound range, but they’re going to get big. They can weigh upwards of 1,200 pounds. These two bison here are going to be the start of our pure bison herd. Their names are Wilma and Zora. And Wilma was named by Gallaudet University and Zora was named by Howard University. Gallaudet University has its mascot as the bison, we are the Bisons. And that’s the reason they chose Howard University, because their mascot is the bison as well. The students were part of the selection process. They chose the name Zora, that’s short for Zora Neale Hurston. She was one of the founders actually of The Hilltop on campus. We chose the name Wilma to recognize an alumni of Gallaudet University. Her full name is The Honorable Wilma Newhoudt-Druchen and is the first female South African parliamentarian. The bison has such a strong attitude, it’s very stoic. You know these are an amazing species. That are so rich in history, conservation messages in North America. They’re an iconic American symbol and to see two, live, here in DC, in the National Zoo, is just amazing. When you are human you feel like you kind of run the world, and then you run up against a 1,200 pound bison, it's like 'maybe I’m not as significant as I thought I was.' So that’s something. They have been brought back from extinction by a lot of efforts, by people here at Smithsonian’s National Zoo, throughout the history.